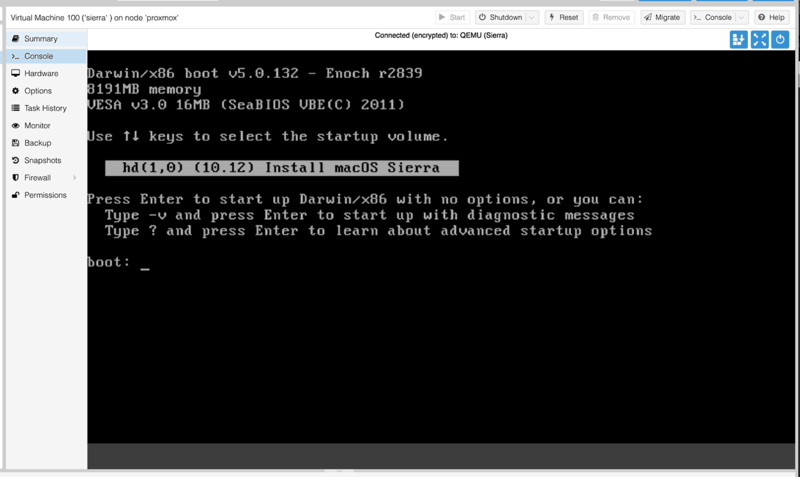 My previous Proxmox post described how to install Sierra into Proxmox using the Enoch bootloader (SeaBIOS boot). Since then, I’ve been using it as my daily-use desktop, and it has generally been working out great for me. However, I had some real struggles getting the graphics card passthrough to work reliably. I managed to fix these by updating to UEFI boot with Clover. One of the problems with legacy BIOS boot and GPU passthrough is VGA arbitration. From what I understand, the video cards in the host and guest can end up both contending to own the VGA resources, which can cause a deadlock on boot. When a Sierra guest loads its video driver during boot, my Proxmox host hangs, and the screen fills with black and white bars. 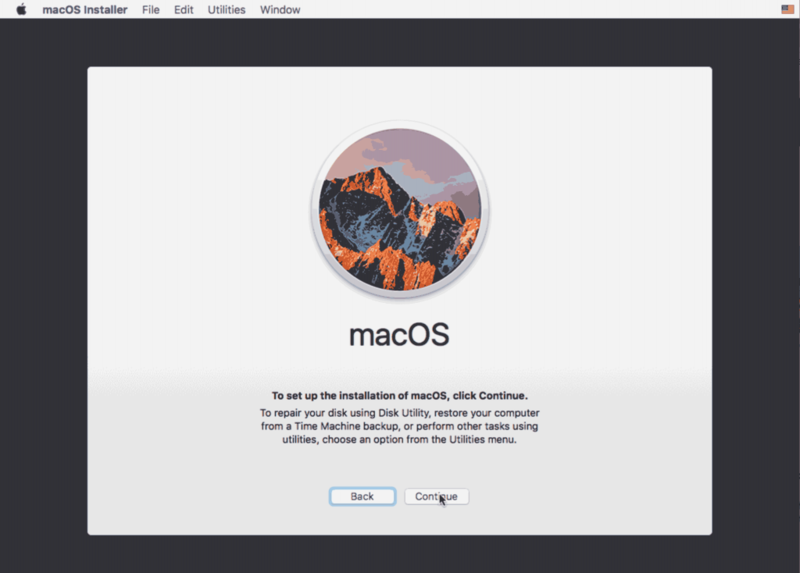 With the release of macOS High Sierra 10.13, this guide is now outdated! Click here to view the new High Sierra guide! 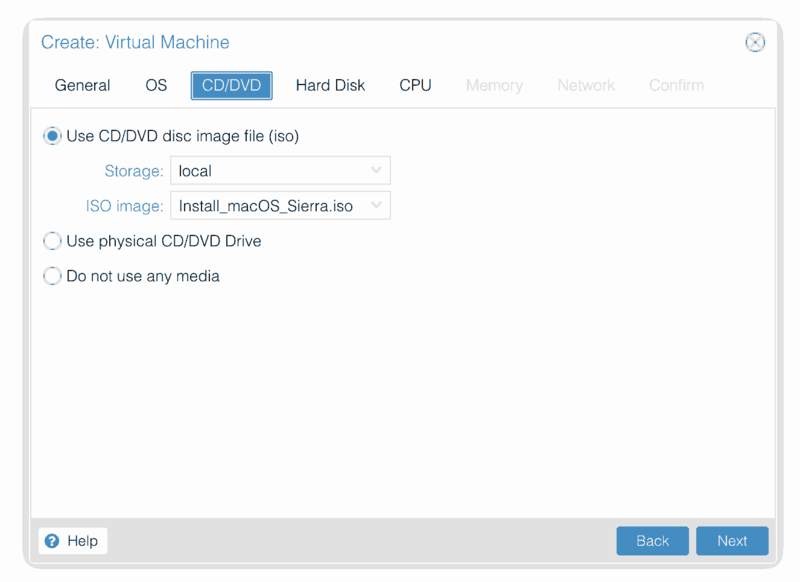 This tutorial for installing macOS Sierra has been adapted for Proxmox 4.4 from this tutorial for Yosemite, and this GitHub project for installing into vanilla KVM. 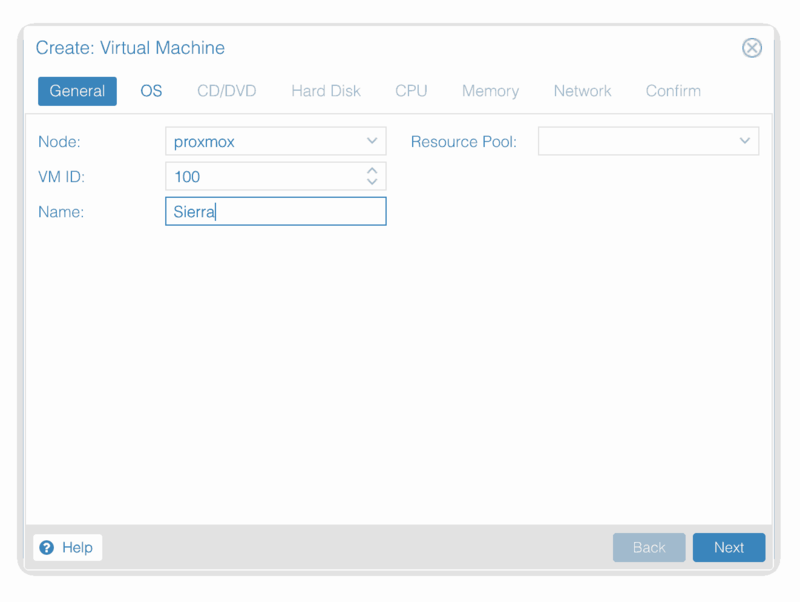 I’ll assume you already have Proxmox 4.4 installed. You also need a real Mac available in order to download Sierra from the App Store and build the installation ISO. Your host computer must have an Intel CPU at least as new as Penryn. I think you may need a custom Mac kernel to use an AMD CPU. These installation instructions have been tested with Sierra 10.12.4. Although it’s been a while since I performed a fresh install, I’m currently running Sierra 10.12.6 on Proxmox 5 using a VM built with these instructions. 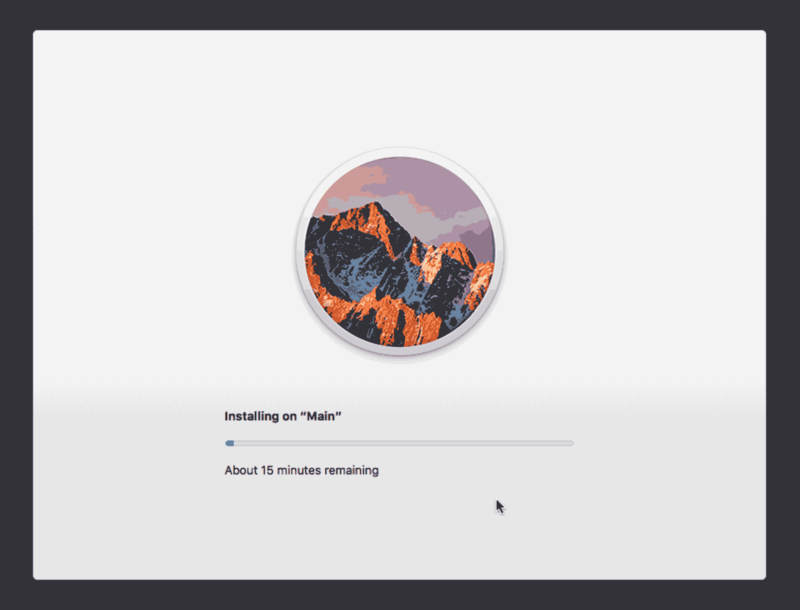 On a Mac machine, download the macOS Sierra installer from the App Store (this will download it into your Applications folder). 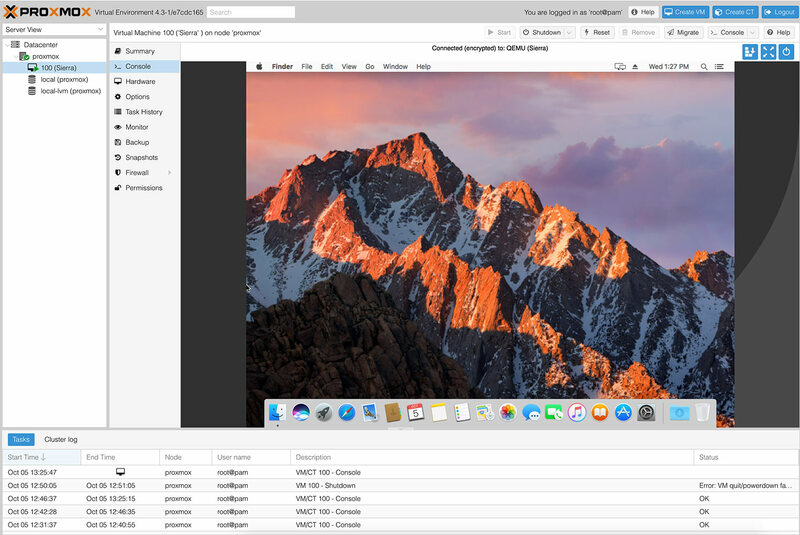 Download the contents of this repository to your mac. 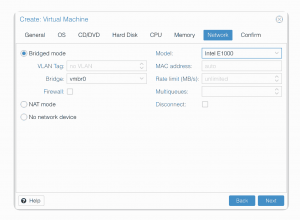 Once that’s done, connect to your Proxmox server using Transmit (or some other SCP/SFTP client) and upload the ISO you created to /var/lib/vz/template/iso. 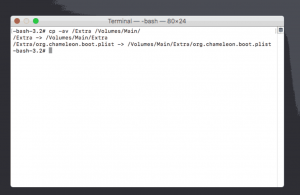 While you’re there, upload the enoch_rev2877_boot bootloader file from the GitHub repository to /var/lib/vz/template/qemu/enoch_rev2877_boot. macOS checks that it is running on real Mac hardware, and refuses to boot on third-party hardware. 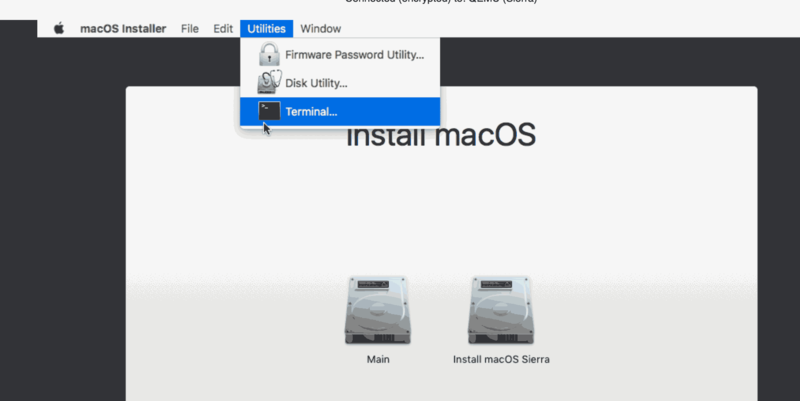 You can get around this by reading an authentication key out of your real Mac hardware (the OSK key). Run the first bit of C code from this page (you’ll need XCode installed) and it’ll print out the 64 character OSK for you. Make a note of it. 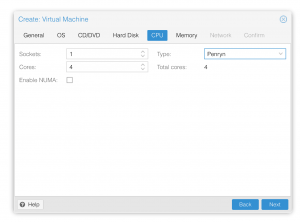 From the Proxmox web UI, create a new virtual machine as shown below. 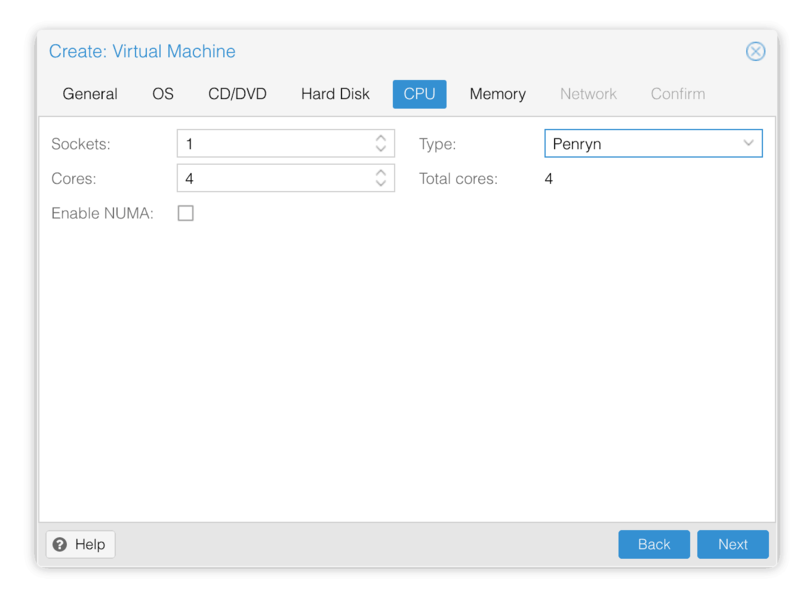 Set the appropriate number of cores and sockets for your CPU (I went with one socket and four cores), and set the CPU type to Penryn. I chose a fixed size memory of 8192MB. I’m unsure if variable memory works on macOS. In the Options page for the VM, change “Use tablet for pointer” to “No”. 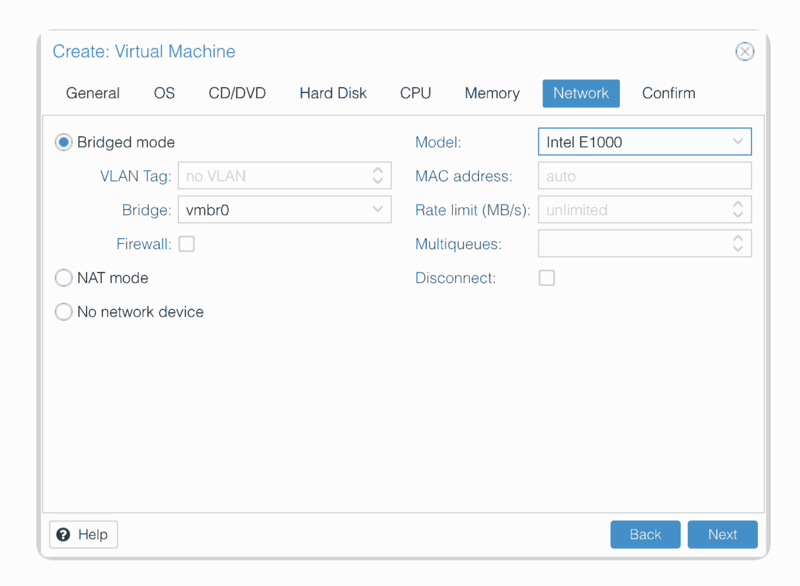 In the Hardware page for the VM, change the the Display to Standard VGA (std). 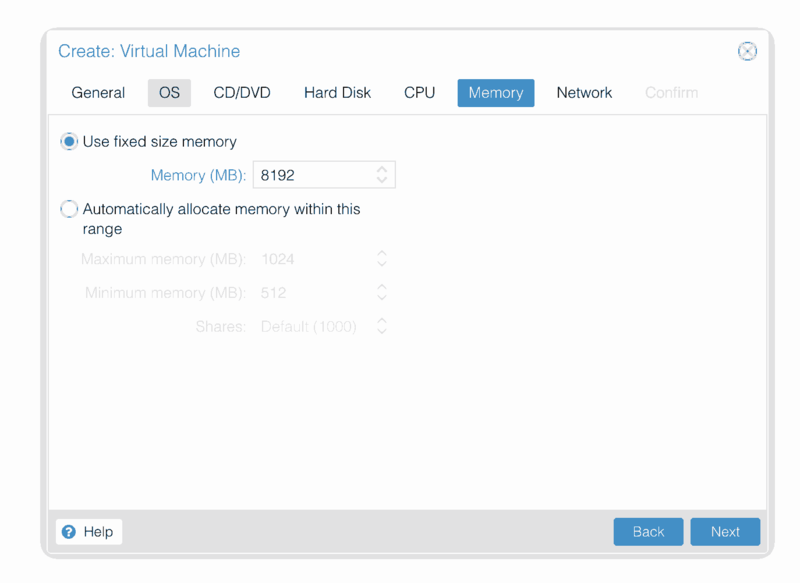 Don’t try to start the VM just yet. 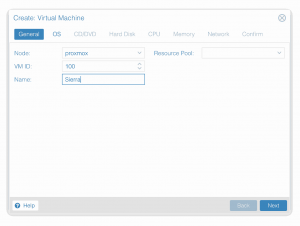 First, SSH into your Proxmox server so we can make some edits to the configuration files. Find the line that specifies the ISO file, and remove the “,media=cdrom” part from the end of the line (otherwise you’ll get stuck at the bootloader). On the net0 line, change “e1000” to “e1000-82545em”. This variant is supported by OS X.
We’ve added those to the config file instead of to the VM’s args directly. If we were to add them to the VM’s args, then when Proxmox constructs its call to KVM to launch the VM, those device definitions would appear before the pve-q35.cfg file is included, which defines the USB busses. However, the device definitions must appear after the definitions of the USB bus that they refer to. Note that this file is whitespace-sensitive, make you you don’t add any blank lines that have extraneous spaces on them. 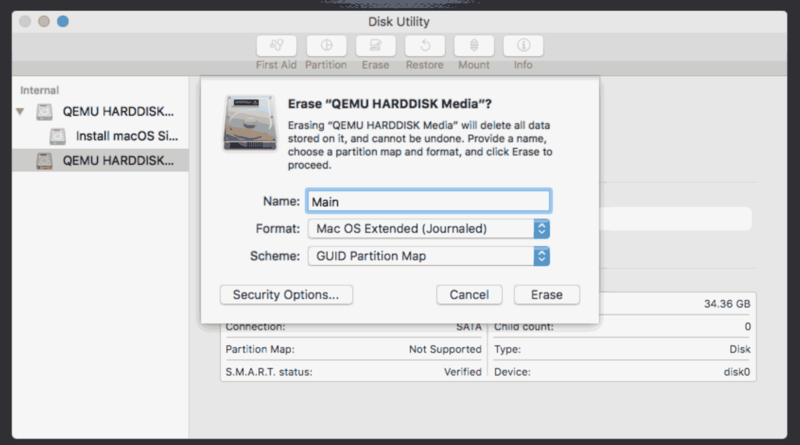 If you’re installing Sierra 10.12.4 or newer, you’ll also need to patch Proxmox’s copy of QEMU in order to be able to boot until this patch is merged by the upstream. 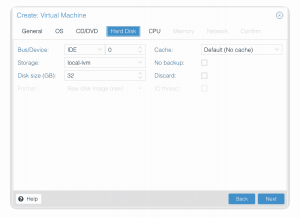 Now start up your VM. If you get an error “file system may not support O_DIRECT / Could not open iso: invalid argument” when starting the VM, you may need to edit the CD drive on the hardware tab and change its cache setting to “writeback (unsafe)”. 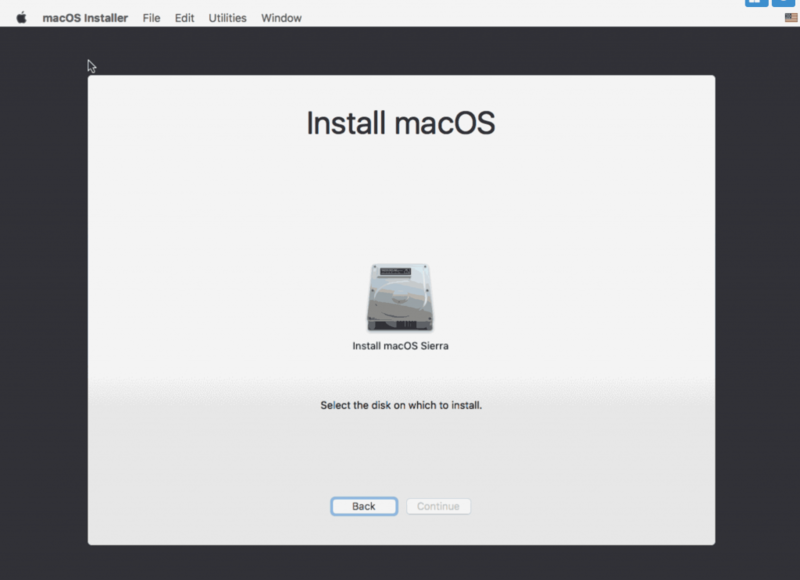 Press enter to choose the “install macOS Sierra” entry and the installer should boot up. If you are unable to move the mouse cursor at the Welcome screen, and a beachball-of-doom appears on the host, you might be using Safari. It seems to get overwhelmed with the number of screen updates on the animated Welcome screen and become unresponsive. Try Chrome instead. Quit terminal. Now you can begin installation to the Main drive. After the first stage of installation, the VM should reboot itself and continue installation by booting from the hard drive. After answering the initial install questions, you’re ready to go! 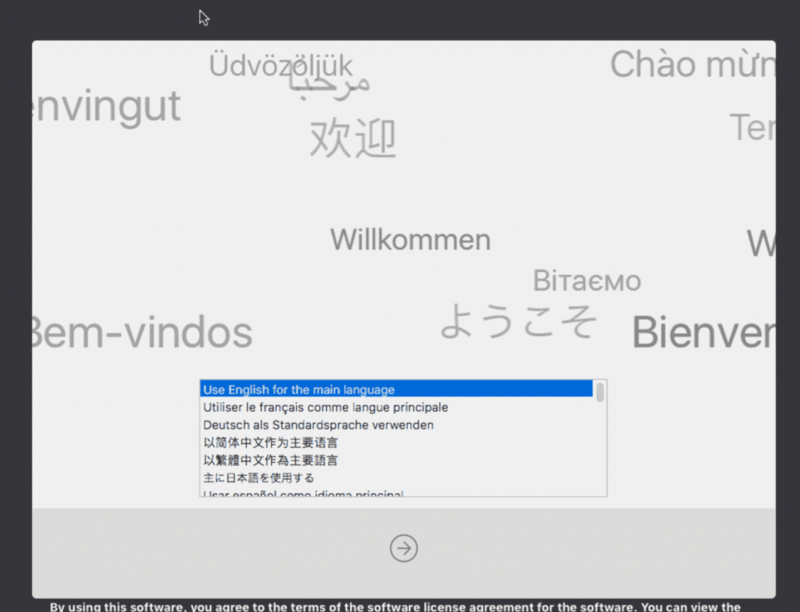 Using noVNC gets pretty annoying due to the Mac’s absence of tablet support for absolute cursor positioning. You can solve this by turning on the Mac’s screen sharing feature and using that instead. But I want to use this as my primary computer, so I’m using USB input devices plugged directly into Proxmox. 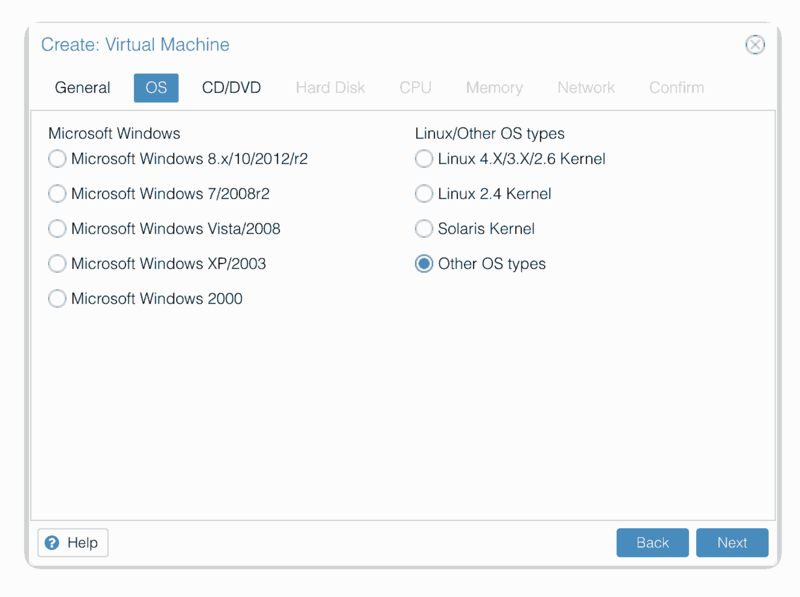 This saves the devices to the VM configuration for you. It’s possible to hot-add USB devices, but I just rebooted my VM to have the new settings apply. For native graphics performance, I wanted to pass through my graphics card for the macOS VM’s exclusive use (driving a monitor connected to Proxmox). 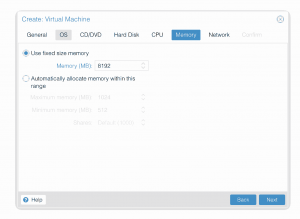 Follow the instructions from the Proxmox manual. Use the “GPU Seabios PCI EXPRESS PASSTHROUGH” section for this installation. Note that your CPU and motherboard need to support VT-d (be sure to enable it in your BIOS as it’s often disabled by default), and your CPU needs to support IOMMU interrupt remapping. After following the instructions to blacklist video drivers in the Proxmox manual, I found I had to run “update-initramfs -u” in order for the blacklist to be applied. Check that your graphics card has been reserved correctly by running “lspci -k” on Proxmox and checking which driver is assigned to the graphics card (if done correctly, it should be “vfio-pci”). After following through all the steps in that guide, I ended up with a new “hostpci0: 01:00,pcie=1,x-vga=on” line in my VM’s configuration, and after a reboot of Proxmox, my graphics card (Radeon R9 280X) was working! Only some cards are natively supported by macOS, check out the tonymacx86 Radeon compatibility list for your card. I also found a list of supported Nvidia cards (some using Nvidia’s Web Driver). I have had success passing through my EVGA GeForce GTX 750Ti SC 2G, driving a 4K screen over DisplayPort and another display over HDMI. 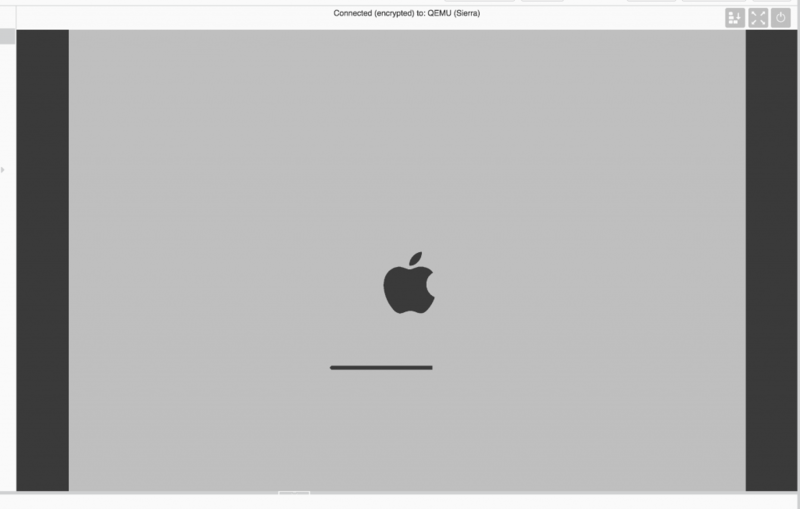 This required me to use Clover/UEFI boot, install the NVidia web drivers, and update my SMBIOS to “iMac 14,2” and enable “NvidiaWeb” in Clover Configurator. 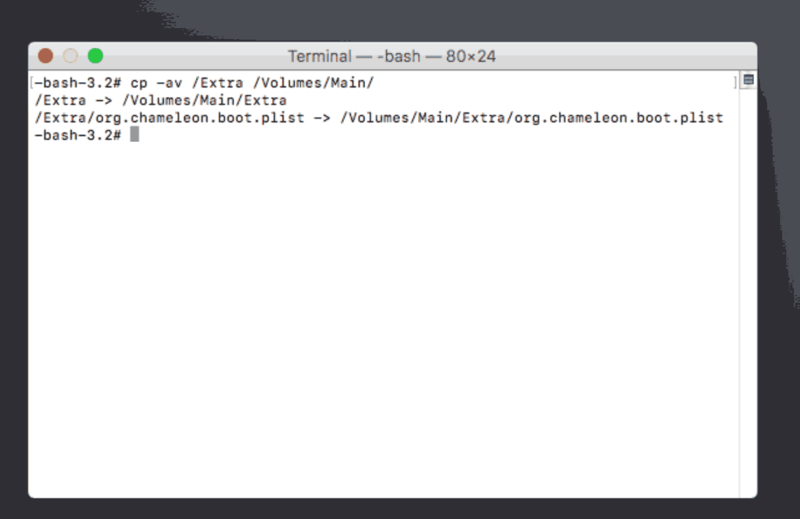 I’ve also written up a guide on converting this VM to use Clover for booting instead of Enoch.